Please know BoxLunch (Hot Topic Inc.) and Disney reserve the right to pre-approve all submitted designs before they are released to the public for brand compliance. While we appreciate your enthusiasm – not all submissions will be available for voting. and powered by Fan Factory – is here! To enter, submit an original design inspired by Experiment 626 and friends. And if we end up using your designs on our merchandise, you'll receive an additional commission. Jordan is the women's & little girls apparel buyer at BoxLunch. Similar to Lilo Ohana is one of the most important thing in Jordan's life. Unlike Lilo she only wishes she lived in Hawaii. When she is not spending time with family you can find her at the beach, the closet ice cream shop, or Disneyland. Linda has never convinced an alien race that mosquitoes were an endangered species or met Pudge who controls the weather, but she is the Buyer of Handbags and Small Accessories at BoxLunch. As a buyer, she's one part product developer, one part negotiator, two parts handbag enthusiast, and three parts lover of cute and fluffy animals. Heather has been a part of Disney Product Design & Development for over 10 years and oversees all Softlines categories of business – including Fashion, Accessories, Home Infant, Pets and Stationery. Heather holds a degree in Fashion Design from Pratt Institute. 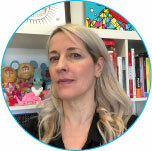 Prior to joining Disney, she was at DLXSF and Betsey Johnson. She is a lover of all things Disney, proud pawrent to 5 rescue chihuahuas, an avid fan of tiny plastic dinosaurs and scared of zombies. Create and submit an original piece of art inspired by Disney Lilo & Stitch for a chance to win an opportunity for your art to be used on a licensed product. Explore the full story of Lilo & Stitch- incorporate secondary characters and environments. This is your chance to let your Lilo & Stitch fandom really come through. Your designs and illustrations can include current themes or favorite icons associated with Lilo & Stitch. Do not use any copyrighted, 3rd party, obscene or inappropriate content, language or imagery. They will not be considered. Winning submissions are intended to become officially licensed product. Avoid using Stitch dressed as Elvis Presley. Do not incorporate any other brands or product with Lilo & Stitch; they cannot appear to be endorsing another brand or featured with another brand. Lilo & Stitch cannot be depicted with other Disney franchises such as Disney•Pixar, Lucasfilm, or Marvel or any other Disney film. NO PURCHASE NECESSARY TO ENTER OR WIN A PRIZE. A PURCHASE WILL NOT IMPROVE YOUR CHANCE OF WINNING. ODDS OF WINNING WILL DEPEND ON THE TOTAL NUMBER OF ENTRIES RECEIVED. MANY WILL ENTER, FEW WILL WIN. Fan Art Contest inspired by Lilo & Stitch begins August 24, 2018 and ends September 20, 2018. Must be age of majority or older to enter who, at the time of entry, are legal residents of and are physically located in the United States, the District of Columbia or Puerto Rico. One (1) grand prize winner will win $2,000 and no fewer than four (4) finalists will each win $300. Ten entries per person during the Contest Period. Total ARV of all prizes is $3,200. Void where prohibited. See Official Rules for additional eligibility restrictions and complete details. Sponsored by Hot Topic, Inc. and BoxLunch 18305 E. San Jose Ave, City Of Industry, CA, 91748 United States ("Sponsor") and administered by Fan Factory, ("Administrator"). 1. CONTEST PERIOD: Submissions will be accepted starting August 24, 2018 at 12:00:00 am Pacific Time ("PT") and ending September 20, 2018 at 11:59:59 pm PT (the "Contest Submission Period"). The judging will take place beginning on: October 11, 2018 through October 18, 2018.
of Hot Topic, Inc., BoxLunch, HU Merchandising, or Disney Consumer Products (“Licensor”) or their respective parents, affiliates, subsidiaries, franchisees, or service agencies (collectively “Contest Entities”); (b) individuals engaged in the development, production or distribution of materials for the Contest or engaged in the administration or execution of this Contest (all such individuals and entities collectively referred to herein as the “Contest Entities”), and (c) persons who are or purport to be immediate family members (defined as biological or step-mother, father, sister, brother, daughter, son, dependent or spouse of any of the foregoing, regardless of where they reside) of any person in any of the preceding categories, regardless of where they live, or who reside in the same household (i.e., live in the same household for at least 3 of the 12 months preceding the start of the Contest Submission Period, whether related or not) as any person in any of the preceding categories. This Contest is subject to all applicable federal, state, and local laws and regulations. Void where prohibited. Licensor is not responsible for the collection, submission or processing of entries, the selection of winners, the provision or delivery of prizes, or the administration of the Contest. 3. HOW TO ENTER: During the Contest Submission Period, enter online by downloading the submission kit and digitally uploading up to ten (10) designs at http://fanfactoryart.com/liloandstitchfanart. Please click if you would like to download a submission kit. In order to submit, contestants must visit the submissions page during the Contest Submission Period and follow the on-screen instructions to upload their original artwork and complete an official entry form, including agreeing to the terms of the user generated content submission agreement (“Submission Agreement”) and click the “Submit Your Design” button to complete the submission form. The uploaded original artwork together with the Submission Agreement and official entry form shall be collectively referred to as the “Entry.” All online entries must be received no later than 11:59:59 PM PT on September 20, 2018. Attempts made by the same individual to enter by using multiple e-mail addresses/social media accounts or otherwise will be disqualified. Mass entries, or entries generated by a script, macro or use of automated devices will be disqualified. Winning designs may be used on product and featured in Hot Topic/BoxLunch stores and websites. From October 11, 2018 to October 18, 2018, a panel of qualified judges to include representatives of the Sponsor will judge all of the eligible Entries received during the Contest Submission Period and will select up to one (1) winner and four (4) runners up based on the judging criteria described below. 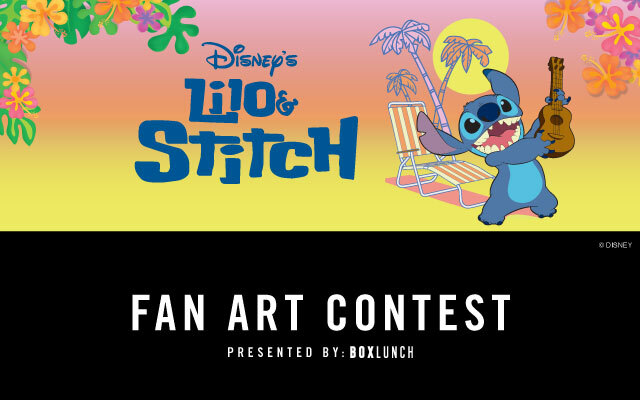 Judging Criteria: (each criterion is followed by its weight in parentheses) submissions digitally uploaded to http://fanfactoryart.com/liloandstitchfanart must depict the character(s) from Lilo & Stitch. Submission will be judged based on (a) Creativity (25%), (b) Originality (25%) and (c) Fits the Lilo & Stitch theme (50%). In the event of a tie, an additional, “tie-breaking” Contest Judge will determine the winning Entry based on the criteria listed herein. The grand prize winner and finalists will be eligible to win the Prizes described below subject to verification of eligibility and compliance with these Official Rules. The Contest Judges' decisions shall be final and binding. 6. PRIZE: One (1) Grand Prize and four (4) runners up prizes are available.. Prize will consist of: One (1) grand prize winner will receive $2,000; and four (4) runners up at $300 each. TOTAL APPROXIMATE RETAIL VALUE OF ALL PRIZES: $3,200. Winners are not entitled to exchange or transfer prizes or to obtain cash or other substitutes, but Sponsor in its sole discretion may substitute prizes of equal or greater value. 7. WINNER NOTIFICATION: Winners will be notified via email beginning on or about January 4, 2019 with instructions on how to be confirmed as a winner and claim their prize. Potential grand prize winner will be required to execute and return an affidavit of eligibility, a liability release, a certificate of authorship documentation assigning all rights, copyright, title and interest in the Entry to Licensor (the "COA"), a W9 form, and, where imposing such condition is legal, publicity release, within the time period specified by Sponsor. Failure to complete and return any of the aforementioned documentation within the allotted time period specified by Sponsor shall result in such Potential Grand Prize Winner's disqualification from the Contest. If a Potential Winner is found to be ineligible or not in compliance with these Official Rules, declines to accept a prize, or Sponsor is unable to contact a Potential Winner within three (3) business days, or in the event that a prize notification or prize is returned undeliverable, the prize will be forfeited and, at the Sponsor's sole discretion, prize may be awarded to an alternate Potential Winner. Potential Winners may be required to furnish proof of identification. If the Potential Grand Prize Winner's entry is accepted for use by Sponsor and Licensor, such Potential Grand Prize Winner hereby irrevocably, in perpetuity assigns any and all rights to the entry to Licensor including all copyrights. At the time Potential Grand Prize Winner is notified that their entry has been selected as the Contest's winning entry, the Potential Grand Prize Winner agrees to execute such documents as requested of them by (including, without limitation, the COA) to effect/confirm the rights assignment to Licensor. If a dispute arises regarding who submitted an entry, the entry will be deemed to be submitted by the authorized account holder of the email address provided at time of entry and must comply with these Official Rules. “Authorized account holder” is defined as the natural person who is assigned to an email address by an Internet access provider, online service provider, or other organization responsible for assigning email addresses for the domain associated with the submitted email address. As a condition of entering, entrants (or their parent or legal guardian if an eligible minor) agree: (a) to release Sponsor, Contest Entities, Administrator, Licensor, each of their affiliates, and each of their officers, directors, employees and agents, from any and all liability, loss or damage incurred with respect to participating in the Contest or the awarding, receipt, possession, and/or use or misuse of any prize or any travel related thereto. Any controversy or claim arising out of or relating to the Contest shall be settled by binding arbitration in a location determined by a single arbitrator as set forth herein (provided that such location is reasonably convenient for claimant), or at such other location as may be mutually agreed upon by the parties, in accordance with the procedural rules for commercial disputes set forth in the Commercial Arbitration Rules of the American Arbitration Association (“AAA”) located at www.adr.org. The judgment upon the award rendered by the arbitrator may be entered in any court having jurisdiction thereof. The arbitrator shall be selected pursuant to the AAA Rules and Procedures. The arbitrator shall apply the laws of the State of California consistent with the Federal Arbitration Act and applicable statutes of limitations, and shall honor claims of privilege recognized at law. In the event that the claimant is able to demonstrate that the costs of arbitration will be prohibitive as compared to the costs of litigation, Sponsor will pay as much of the claimant's filing and hearing fees in connection with the arbitration as the arbitrator deems necessary to prevent the arbitration from being cost-prohibitive. If any part of this arbitration provision is deemed to be invalid, unenforceable or illegal (other than that claims will not be arbitrated on a class or representative basis), or otherwise conflicts with the rules and procedures established by AAA, then the balance of this arbitration provision shall remain in effect and shall be construed in accordance with its terms as if the invalid, unenforceable, illegal or conflicting provision were not contained herein. If, however, the portion that is deemed invalid, unenforceable or illegal is that claims will not be arbitrated on a class or representative basis, then the entirety of this arbitration provision shall be null and void, and neither claimant nor Sponsor shall be entitled to arbitrate their dispute. Upon filing a demand for arbitration, all parties to such arbitration shall have the right of discovery, which discovery shall be completed within sixty days after the demand for arbitration is made, unless further extended by mutual agreement of the parties. The prevailing party shall be entitled to an award by the arbitrator of reasonable attorneys' fees and other costs reasonably incurred in connection with the arbitration. THE ARBITRATION OF DISPUTES PURSUANT TO THIS PARAGRAPH SHALL BE IN THE ENTRANT'S INDIVIDUAL CAPACITY, AND NOT AS A PLAINTIFF OR CLASS MEMBER IN ANY PURPORTED CLASS OR REPRESENTATIVE PROCEEDING. THE ARBITRATOR MAY NOT CONSOLIDATE OR JOIN THE CLAIMS OF OTHER PERSONS OR PARTIES WHO MAY BE SIMILARLY SITUATED. DO NOT ENTER THIS CONTEST IF YOU DO NOT AGREE TO HAVE ANY CLAIM OR CONTROVERSY ARBITRATED IN ACCORDANCE WITH THESE OFFICIAL RULES. BY PARTICIPATING IN THE CONTEST, EACH ENTRANT AGREES THAT TO THE EXTENT PERMITTED BY APPLICABLE LAW: (1) ANY AND ALL DISPUTES, CLAIMS AND CAUSES OF ACTION ARISING OUT OF OR CONNECTED WITH THE PROMOTION, OR ANY PRIZE AWARDED, WILL BE RESOLVED INDIVIDUALLY THROUGH BINDING ARBITRATION AS SET FORTH ABOVE, WITHOUT RESORT TO ANY FORM OF CLASS ACTION; (2) ANY AND ALL CLAIMS, JUDGMENTS AND AWARDS, INCLUDING WITHOUT LIMITATION LEGAL CLAIMS, COSTS, INJURIES, LOSSES OR DAMAGES, DEMANDS OR ACTIONS OF ANY KIND (INCLUDING WITHOUT LIMITATION PERSONAL INJURIES, DEATH, DAMAGE TO, LOSS OR DESTRUCTION OR PROPERTY, RIGHTS OF PUBLICITY OR PRIVACY, DEFAMATION, OR PORTRAYAL IN A FALSE LIGHT) (COLLECTIVELY, “CLAIMS”), WILL BE LIMITED TO ACTUAL THIRD-PARTY, OUT-OF-POCKET COSTS INCURRED (IF ANY), BUT IN NO EVENT WILL ATTORNEYS' FEES BE AWARDED OR RECOVERABLE; (3) UNDER NO CIRCUMSTANCES WILL ANY ENTRANT BE PERMITTED TO OBTAIN ANY AWARD FOR, AND ENTRANT HEREBY KNOWINGLY AND EXPRESSLY WAIVES ALL RIGHTS TO SEEK, PUNITIVE, INCIDENTAL, CONSEQUENTIAL OR SPECIAL DAMAGES, LOST PROFITS AND/OR ANY OTHER DAMAGES, OTHER THAN ACTUAL OUT OF POCKET EXPENSES), AND/OR ANY RIGHTS TO HAVE DAMAGES MULTIPLIED OR OTHERWISE INCREASED; AND (4) ENTRANT'S REMEDIES ARE LIMITED TO A CLAIM FOR MONEY DAMAGES (IF ANY) AND ENTRANT IRREVOCABLY WAIVES ANY RIGHT TO SEEK INJUNCTIVE OR EQUITABLE RELIEF. SOME JURISDICTIONS DO NOT ALLOW THE LIMITATIONS OR EXCLUSION OF LIABILITY, SO THE ABOVE MAY NOT APPLY TO EVERY ENTRANT. 9. For the sole purpose of submitting your Entry for evaluation and potential commercial use, you are hereby granted a limited, non-exclusive, non-transferable, non-sublicenseable, revocable, royalty-free license to create a derivative work using Disney Elements as required for the purpose of creating your Entry, provided that such license shall be conditioned upon your assignment to Disney of all rights in the work you create, as set forth more fully in paragraph (iii) below. You are not granted any rights to use Disney Elements for any other purpose. “Disney Elements” are defined as elements adapted from, based on, by direct reference or by inference to (e.g., by shape or outline but without specific features), any intellectual property (e.g. copyrights, trademarks, trade dress, art works, characters, logos, brands, symbols, devices, slogans, tag lines) of Disney, its affiliates, or its/their licensors, or any variation thereof. 10. You acknowledge that the Entry artwork you are submitting, or elements or portions thereof, may be similar or identical to the many ideas, suggestions, or creative elements developed by Disney's personnel or that Disney shall have no liability to you for the use of material independently created by Disney personnel or others, even if such material is substantially similar or identical to the Entry artwork proposed by you. 11. If your Entry is selected as the winner, you agree to assign to Disney the entire right, title, and interest in and to the copyright in your Entry including the right to sue for past infringement and the right to further sublicense the Entry. You also acknowledge that you waive all "moral" rights that you may have in and to your Entry. Disney may register the Entry artwork with the US Copyright Office in the name of Disney as the Claimant, and you as the Author. You agree to provide Disney with minimal information as may be required in order to register the copyright in the Entry artwork if Disney so requests, at no cost. If such rights are not assigned to us, your license to create derivative works using Disney Elements set forth in paragraph (i) above shall be null and void. 12. The Official Rules and the Contest are governed by US law and are subject to all applicable federal, state and local laws and regulations. All issues and questions concerning the construction, validity, interpretation and enforceability of the Contest Official Rules, or the rights and obligations of entrant and Sponsor in connection with the Contest, shall be governed by, and construed in accordance with, the laws of the State of California, U.S.A., without giving effect to the conflict of laws rules thereof, and any matters or proceedings which are not subject to arbitration as set forth in the above of these Official Rules and/or for entering any judgment on an arbitration award, shall take place in the State of California, in the City of Los Angeles. 13. Sponsor reserves the right in its sole discretion to cancel, modify or suspend this Contest at any time if fraud, technical failures, including any network server or hardware failure, viruses, bugs, errors in programming, or any other errors or other causes corrupt the administration, security, integrity or proper play of the Contest and, if cancelled, at Sponsor's discretion, to select the Winners from all eligible entries using the procedure outlined above. 14. Sponsor and the Contest Entities do not warrant that access to the Contest will be uninterrupted. Sponsor and the Contest Entities are not responsible for any problems that may arise, including but not limited to; (a) lost, interrupted, inaccessible or unavailable networks, servers, satellites, Internet Service Providers, Websites, or other connection, availability or accessibility problems arising in connection with or over the course of the Contest; or (b) communications failed, jumbled, scrambled, delayed, or misdirected computer, telephone or cable transmissions or hardware or software malfunctions, failures or difficulties; or (c) failure of personal computers and/or software and hardware configurations, any technical malfunctions, failures, or difficulties, printing errors, clerical, typographical or other error in the offering or announcement of any prize or in any prize notification documents; or (d) for any other errors of any kind relating to or in connection with the Contest, whether human, mechanical, clerical, electronic, or technical or otherwise, including, without limitation, any errors which may occur in connection with the administration of the Contest, the processing of registrations or entries, the uploading of submissions, the judging of entries, the tabulation of scores, the announcement of the prizes or in any other Contest-related materials; or (e) the incorrect or inaccurate capture of information, or the failure to capture any information in connection with the Contest; or (f) damage to a user's computer systems, networks, or data occasioned by participation in this Contest or downloading any information necessary to participate in this Contest. 15. Any attempt by an entrant or other individual to deliberately damage any website or undermine the legitimate operation of this Contest, including but not limited to any fraudulent claims, is a violation of criminal and civil laws. Should such an attempt be made, Sponsor reserves the right to seek remedies and damages from any such individual, to the fullest extent permitted by law, including criminal prosecution. Entrant engaging in any of the foregoing activities may be disqualified, will forfeit any prize(s) won, and all associated Entries and/or scores will be void. 16. In the event of any conflict with any Contest details contained in these Official Rules and Contest details contained in contest marketing materials, if any, (including but not limited to point of sale, television, and print advertising, promotional packaging, and other promotion media), the details of the Contest as set forth in these Official Rules shall prevail. 17. The invalidity or unenforceability of any provision of these Official Rules shall not affect the validity or enforceability of any other provision. In the event that any provision is determined to be invalid or otherwise unenforceable or illegal, these Official Rules shall otherwise remain in effect and shall be construed in accordance with their terms as if the invalid or illegal provision were not contained herein. In particular, Sponsor's employees are not authorized to waive, modify or amend any provision or provisions of these Official Rules in any manner whatsoever. 18. This Contest is solely sponsored by Hot Topic, Inc., 18305 E. San Jose Ave, City Of Industry, CA, 91748 United States and Administered by Fan Factory. 19. For any legally required notice of the Prize Winner, send a self-addressed postage stamped envelope to: HOT TOPIC Fan Art Contest / LILO & STITCH– Winner List Request”, 18305 San Jose Ave, City of Industry, CA 91748, to be received by February 31, 2019. Winner's notice will be sent after all prizes have been awarded. 20. Odds of winning depends on the number of entries received, and the judged level of creativity, originality and relevance, per the judges' criteria, of the entry submission. 21. To see how we use personal information obtained in connection with this Contest, please visit http://www.boxlunch.com/customer-service/privacy-policy/ or http://www.hottopic.com/customer-service/privacy-policy/ Personal information may be collected, used or disclosed. Neither Sponsor, Administrator nor Contest Entities will sell, share or otherwise disclose personal information of entrants with third parties or agents, other than to third parties or agents engaged by Sponsor to fulfill the above purposes or as permitted or required by the applicable laws. If you are selected as a winner, your information may also be included in a publicly-available winner's list.